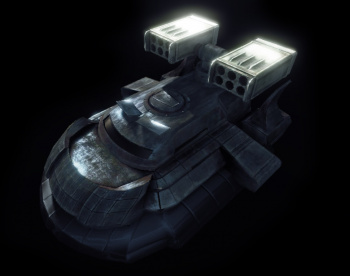 The Harasser is an Inner Sphere light hovercraft. It has weak armor but helps compensate for this with a GECM to mask its movements, and a BAP to locate foes at a distance. When an enemy is detected the Harasser may outrun enemy thanks to its high speed and acceleration. A Harasser is the fastest ground unit available, giving it a chance to choose when and how to fight - by the time it is noticed, it may have already fired and flitted away. The Harasser combines its speed with very nimble handling, capable of out-turning the Owens. However, it suffers greatly on rough terrain, as the Harasser's high center of mass causes it to behave erratically and flip over easily. The unique feature of Harasser is it's speed - unlike any other unit Harasser "boost" function does not create additional heat, giving it one additional gear. 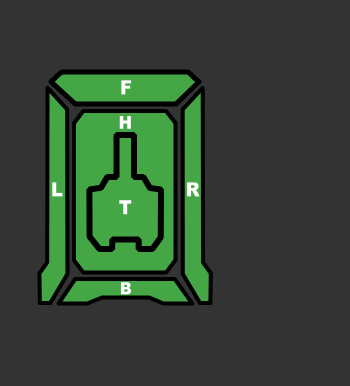 This was made for easier control of this speed beast, as players were known to have difficult times controlling Harasser with its speed set to current boost level. Because of this player can move up to 116km/h of regular speed, and up to 163km/h with the 6th gear for the cost of reduced turning rate. Careful use of the boost function can allow Harasser pilots to drive up extremely steep terrain. The Prime variant is used for Mech support, packing twin SSRM6 launchers backed up with a GECM package. Well suited for open terrain, this variant works best at circling the enemy, pumping SSRM fire into the enemy to shake them up. A skilled pilot can arc the SSRMs over cover, fire on the retreat, and use the Harasser's body itself to set up optimal firing solutions. As with all Harassers, it is an fragile asset and will melt under return fire; pilots should strive to be unnoticed. The A variant is used for long range support. It's double LRM10s are able to inflict damage at significant range, while its very high speed protects it from nearly any attempt of an attack. The best method to destroy it is to approach stealthily on passive radar until 900m, and then to attack with long-range direct-fire weapons such as Gauss or ERPPC. Featuring 2 MXPL and 2 MBL, this variant is suited to sitting on the sidelines, slicing off limbs. Damage drops off when mobile, however, as the Harasser is exceptionally difficult to keep steady. The 'Sparkle', is essentially a poor man's Epona. Surpassing some of the more expensive Clan hovercraft in raw firepower, 6 SXPLs firing continuously will easily core the most heavily armored of enemies. Sparkle will readily toe it with any light, most mediums, and, in the hands of an experienced pilot, is entirely capable of feeling any Heavy or Assault mech. This, combined with GECM, BAP and enough heat sinks to fire for a good half a minute without pause, the Harasser C spells shiny red doom for its enemies. The Harasser D "Mr. Toast & Go" comes with more high-risk than other variants because it mounts 6 extremely close range flamers which can shut down any mech that does not have plenty of heat sinks, and can even cause mechs to overheat and explode. Traveling in pairs enables them to completely shut down a mech. These units are hyper-lethal and should be focus-fired from extreme range, though its GECM often leaves precious little warning of its approach. A budget early game supporting brawling unit, best used in conjunction with teammates. A pair of LPPCs and a single LBX5 allows it live up to it's name at short range, and pester other units from range. The screenshake induced from the LPPCs can hinder precision fire. One of the earliest NARC assets that you can bring into the field, it's potential is only limited by the lack of LRMs in the early game. However, with a bit of coordination, this can turn into a more or less viable tactic. During the later parts of the battle, it is still a viable choice for NARCing target; however, by then, there are better vehicles available to offer guidance support for you LRM boats. Alas, TBolt5's steering is so slow, one almost cannot make use of the NARC, making this a rather odd choice of weapons. This variant is the embodiment of the 'Glass Cannon' ethos, sacrificing the typical GECM to mount two DSRM4s. This loadout brings a comical amount of firepower to the field, earning it a spot amongst the highest burst-damage assets in the game. With the capacity to launch 48 limb-removing salvos from 2 Tons of ammunition; its deadly if ignored during a fight. Whether you are facing early light mechs or removing armor from heavies- your satisfaction level increased tenfold at every pull of the trigger. The Harassers were extremely cheap to manufacture, and were produced in large numbers, as they were incorporated into the Galleon Light Tank units within the Free World League. Its best defensive strategy is to use its speed. Harasser can run circles around heavier BattleMechs and making it a much harder target to hit. This page was last edited on 22 March 2019, at 20:25.